Be the first to share your favorite memory, photo or story of Sophia. This memorial page is dedicated for family, friends and future generations to celebrate the life of their loved one. 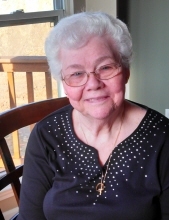 Sophia Mae Eppensteiner of Commerce Township, passed away surrounded by her loving family on Friday, March 29, 2019 at the age of 83. Sophia is survived by her daughter, Cheryl (Paul) Chevalier and her son, Fred (Jen) Eppensteiner; granddaughter Olivia Eppensteiner; her brother John (Carol) McKnight; and her brother-in-law Jack Young as well as extended family and dear friends. She was preceded in death by her husband, Fred and by her siblings, Frederick (Lorrie) Jensen, Florence “Flossie” (Lenny) Barone, Charles McKnight and Claire Young. Sophia's family would like to thank Dr. Ajay Gupta and the Thoracic Surgery team at St. Joseph Mercy Ann Arbor for doing all they could. Visitation will take place at Lynch & Sons Funeral Home, 600 East Main Street, Brighton on Tuesday, April 2, 2019, from 3 - 8 PM. Funeral Service will be held at Lynch & Sons Funeral Home, 600 East Main Street, Brighton on Wednesday, April 3 at 11 AM. The Rev. Sherry Parker-Lewis to officiate. Burial at Fairview Cemetery, Brighton, MI. In lieu of flowers memorial contributions are encouraged to the American Cancer Society and the American Heart Association. For further information, please phone Lynch & Sons, Brighton at 810-229-2905. "Email Address" would like to share the life celebration of Sophia Mae Eppensteiner. Click on the "link" to go to share a favorite memory or leave a condolence message for the family.